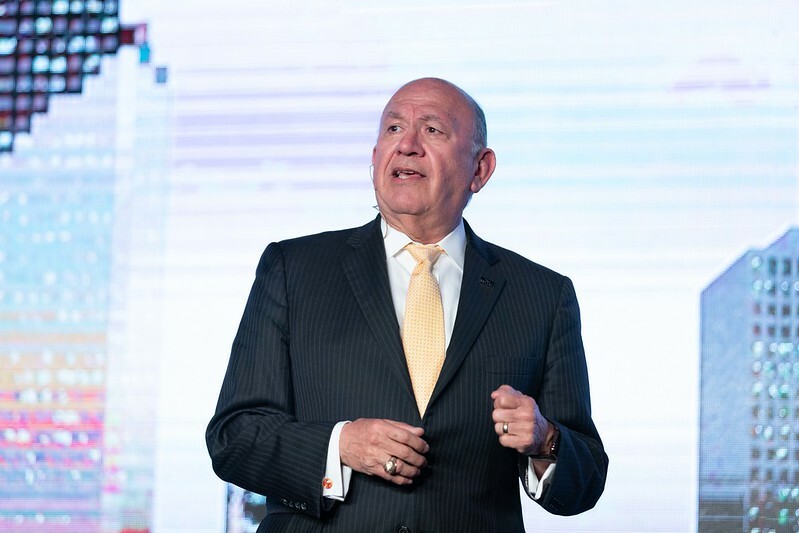 During an inspiring, yet frank, address to legislators, industries, educators and community partners, Houston Community College (HCC) Chancellor Cesar Maldonado, Ph.D., P.E., said the college, like the city, has many opportunities to thrive and grow, but only if it recognizes where those exist. Speaking to a crowded ballroom gathered Wednesday to watch HCC’s State of the College event at the Hilton Americas-Houston, Dr. Maldonado launched his talk with what HCC’s research revealed about education’s needs and what it’s doing to meet them. HCC is filling that critical need, Dr. Maldonado said, by training skilled technicians, certifying accountants and IT techs, licensing peace officers and RNS and training medical assistants and computer coders. Four years ago, HCC began a transformation, Dr. Maldonado said, to meet the growing shift in workforce demand for highly skilled workers. In doing so, HCC has made a profound impact on Houston’s economy. Served more than 105,000 unique students. “Over that same period, our alumni created $4.3 billion in added income,” said Dr. Maldonado. The year 2018 saw HCC facilities expansion projects, partnerships and new programs. A $425 million capital improvement plan—that was completed under budget—resulted in the West Houston Institute, a state-of-the-art interactive work environment delivering experiential learning through real-world applications. In addition, HCC’s new STEM building at Southeast College will inspire visitors to attend college with its powerful telescope, as well as the planned Challenger Learning Center, with a Mission Control Room and Space Station. The new 10-story HCC Coleman College Health Sciences Tower, the only one of its kind in the Texas Medical Center, also opened, offering simulated hands-on experience, equipment and technology found in today’s top hospitals. Dr. Maldonado also touted impactful HCC partnerships and apprenticeship programs, such as the RigOne simulation lab, training roustabouts; a state-of-the-art simulated hospital in the Texas Medical Center, preparing for routine and trauma scenarios; with JPMorgan Chase to train in IT; with CVS, for pharmacy tech experience; and the highly recognized joint venture with TRIO Electric and Spring Branch ISD that results in high school graduates earning college credits and good paying jobs as journeyman electricians. This was only one of several high school joint ventures Dr. Maldonado discussed. Higher education partnerships are also noteworthy, said Dr. Maldonado. Unlike other colleges in Texas, HCC has not pursued its own baccalaureate degrees, but instead developed an innovative shared-resource model that allows it to joint-venture with university partners. Sharing faculty, curriculum and facilities allows HCC to deliver baccalaureate degrees in many disciplines to students at a low cost. “Simply put, our students achieve baccalaureate degrees without ever leaving their HCC campus,” said Dr. Maldonado. HCC has such joint-ventures with UT-Tyler, Stephen F. Austin University, University of Houston Downtown, Texas Southern University, Prairie View A&M University and the Chevron Engineering Academy with Texas A&M University. In HCC’s latest work with UHD, it added a BS Nursing program, where students can receive an associate degree in nursing and RN licensing through HCC and continue in UHD’s BSN program, all in the same building, same labs and, most importantly, with the same faculty. In other innovations, HCC leads the field in its partnerships with AARP for seniors, the Houston Food Bank to address the needs of student hunger, Z-Degree to fight the high cost of books and iCDS to bridge the gap in computer science training for minorities. Strategic planning and expansion will take center stage in 2019. Dr. Maldonado said that, as Houston continues to grow and expand westward, HCC will continue moving its current Katy Campus in a co-location partnership with the University of Houston. HCC will provide the first two years of academic programming for all students, who will then seamlessly transfer to UH in Katy. This expanded campus will provide a strong focus on engineering, nursing and workforce-related programming. For the University of Houston Downtown and Southeast and Central colleges partnerships, HCC is expanding its joint-venture model with UHD, adding baccalaureate offerings in computer science and manufacturing engineering. Dr. Maldonado said that STEM initiatives will also continue to expand, building on exclusive and forward-thinking partnerships with Apple, Sony and Audi, allowing students to excel in 3D printing design, robotics, and coding for apps. Based on Houston’s experiences with natural disasters, HCC is in the early development of the forward-thinking HCC Regional Emergency Response Training Center at Northeast College. Dr. Maldonado said the futuristic 65,000 square foot complex will train up to 4,000 first responders annually in high- and swift-water rescue operations. Also praising the HCC Foundation, Dr. Maldonado said HCC is working toward a future where every student is able to earn a degree or certificate without paying. In closing, Dr. Maldonado said graduation rates are up. Costs and excess credit hours are down, and that HCC is supplying a steady stream of accredited graduates to industries across the region. But the work, he said, is not done.